The big budget Hollywood satire is more than just an oxymoron, it is simply bewildering. 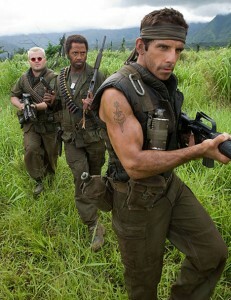 How could a $90 million movie, distributed by Dreamworks, a company co-founded by Steven Spielberg, and owned by Viacom, be hard on “the business?” The answer is, it can’t, and therefore Tropic Thunder is a very broad and obvious satire, with jokes at easy targets and previously established pariahs (spoiled, arrogant, and oblivious actors, domineering and abusive producers, Vietnam movies, films made for the sole purpose of being Oscar bait). But that doesn’t mean it isn’t extremely funny. Normally, a movie with Ben Stiller would have him playing one of two different types of roles, the patsy who is repeatedly embarrassed while he stammers to try to explain the logic of the situation amidst plentiful slapstick, but never gets a chance to (There’s Something About Mary, Meet the Parents/Fockers, Along Came Polly, Flirting With Disaster), or the idiotic, angry, haughty primadonna, prone to strange costumes, haircuts and non-sequiturs (Zoolander, Dodgeball, If Lucy Fell, Mystery Men). 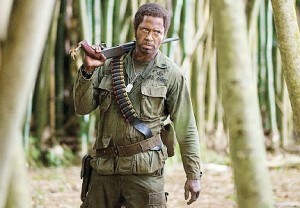 Tropic Thunder gives him an opportunity to do more of the latter as an actor, and mock the former as a writer/director. Opening with a barrage of hilarious faux trailers, establishing the four main characters (Jack Black as a fart movie king, Stiller as a fading action hero, Robert Downey Jr. as the prestigious, serious “film” actor, Brandon T. Jackson as a rap entrepreneur/sell-out, hocking an “Urban” energy drink), Tropic Thunder scatters off in numerous directions, mocking whatever it can, which generally would make the movie rather unfocused and rambling, and the pacing slowed down to a crawl. The movie is long and unfocused, but the surprise is how much energy it maintains, and how must effort is apparent, which causes the lulls to be washed over with humorous asides. Robert Downey Jr. is especially great as the classy actor who underwent racial reassignment to portray a black character, and takes the notion of staying in character to a ridiculous extreme. “I don’t break character til after the DVD commentary.” He also has one of the film’s highlights, explaining to Stiller, that if you want to win the awards when playing a mentally challenged person, you have to allow the audience to relate to you, and “never go full retard.” On top of that, Downey Jr. has seemingly hundreds of mumbled, improvised bits, all of which are funny, when understandable, and almost asking us to see the movie again to pick up what we missed. The TV ad suggests that the movie might be one-note, actors thinking they are in a war film, deliberately thrown to the wolves into real conflict, and really, it is, but the fact that it sustains that idea, and continuously expands upon it, is more than just a minor miracle. 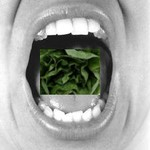 This entry was posted on Sunday, February 22nd, 2009 at 3:41 pm	and is filed under Action/Adventure, Comedy. You can follow any responses to this entry through the RSS 2.0 feed. You can leave a response, or trackback from your own site.